Mobile Ad Frauds – Choose Apps for Your Advertising Carefully! Despite growing investment in programmatic and mobile advertising, anxiety still looms – 60% of agency professionals said inventory quality is one of their biggest fears, according to a recent eMarketer report; and they’re right to be worried. Despite many deploying solutions and strategies to help prevent against fraud, malicious activity is still seeping through. Newer channels like mobile are no exception. Many marketers – perhaps encouraged by the ‘safety net’ that app stores provide – turn to in-app inventory as a way to guarantee higher quality and avoid fraud. But research shows that fraud still exists within apps – even those certified by the Apple App Store and Google Play – which means advertisers must take a strategic and cautious approach to protect themselves when buying any type of inventory. Since the dawn of smartphones, apps have had to undergo strict certification and approval processes before becoming available in app stores. The majority of apps on consumer devices are certified, but a recent Sizmek analysis of hundreds of millions of in-app ad impressions found that 10% of mobile ad traffic comes from uncertified apps. These are not downloaded from the major official app stores, meaning they are not verified and approved. They can damage the consumer experience on their mobile device, and pose a serious threat to advertisers. Over half of uncertified apps were found to be engaging in ad fraud – such as running ad calls in the background that weren’t visible to the user. A large portion of these apps arrived on consumers’ devices via torrents – technology used to distribute files over the internet. As torrent websites are often supported by low-quality ads, it makes sense that apps acquired this way would also have negative ad experiences. You might think advertisers would go to any lengths to avoid uncertified apps; but the advent of programmatic, which enables buyers to value ad inventory based on their own criteria, could lead some buyers to prioritise other data points, such as user behaviour or geolocation, instead of an app’s certification status. This would be a foolish strategy though, since any advertiser buying inventory on uncertified apps will start out with a high percentage of wasted impressions. Avoiding uncertified traffic must be a priority for all advertisers. Alternatively, while many brands believe that buying ads on certified apps alone will keep them free from fraud, Sizmek identified malicious activity within apps that were downloaded from official sources, with nearly one-in-10 (8%) of certified apps found to be engaging in fraudulent behaviour. This occurs when blacklisted developers find ways to game the system. They may develop 50 apps and receive 49 rejections from the app stores; but the one that gets through participates in fraud. In some cases, apps were generating traffic through Android, but not iOS, and vice versa, meaning that they were likely rejected by one store but certified by the other. The bad news is there’s no sure-fire way to prevent against in-app fraud on certified apps, but there are precautions ad buyers can take to try and ensure they are matching their ads with high-quality impressions and engaged consumers. The majority of consumers only use and access certified apps that they have downloaded from the app stores; and that gives advertisers options for targeting which apps they buy inventory from. One little-explored tactic is to use metadata from the app stores to execute strategic and safe buys. Media buyers can use this metadata to only buy inventory in apps with four-star ratings, or higher, indicating a high-quality app. This can also be used to buy only on apps with more than 500,000 downloads or 500,000 ratings, numbers that can confirm popularity and high usage. Advertisers can even target only on apps that are rated safe for all ages, further ensuring that their ad messages only appear near brand-safe content. In the end, there is no method of buying completely fraud-free advertising without taking precautions, so advertisers must remain vigilant in their mobile ad buying. Apps are certainly a safer way of reaching consumers on devices; but advertisers should build a mobile media plan that uses targeting and metadata to ensure that they reach active, engaged consumers and eliminate waste throughout the campaign. Click here for a free consultation with our mobile experts. Ratings & reviews have always played a remarkable role in influencing users to download the app. It is also one of the key factors to consider while doing app store optimization, but these were mostly out of the developer’s control as it was not possible to interact or respond to user reviews. Click here to know more about ASO and what Supreme Media has to offer for your app’s success. Apple is finally going to give its developers a way to respond to customer reviews on its App Store and Mac App Store – a feature that’s long been available to Android developers on Google Play, much to the chagrin of the Apple developer community. According to developer documentation for the iOS 10.3 beta, when this version of Apple’s mobile operating ships, developers will also be able to ask for reviews in new ways, in addition to responding to those posted publicly on the App Store. Apple’s ratings and reviews system has felt antiquated, and has been a source of frustration for developers and users alike. When a customer leaves a negative review, developers couldn’t respond to the criticism – which is sometimes unwarranted – in a way that other App Store customers could see. For example, a customer may be misunderstanding a feature, or may have complained about a bug that’s been fixed in a later release. Being able to quickly clarify the situation in a public manner could help to encourage other potential customers to give the app a try. In addition, these public comments stand as sort of a record of sorts – something that’s helpful for customers who want to know if the developer actively supports the application and considers user feedback. This serves as another signal that the app is worth the download or the purchase price, especially in an ecosystem where so many apps had been abandoned that Apple had to purge its App Store of outdated applications late last year. While this is one of the most welcome changes that’s shipping in the new release from a developer perspective, it’s not alone. Related to this, Apple says it will also introduce a new way to solicit reviews in iOS 10.3. With the introduction of a new API, developers can ask users to rate or review the app while they’re using it, without being redirected to the App Store. This will go a long way towards reducing the nag screens in today’s current crop of applications – some of which bug you to rate the app upon nearly every open. Positive ratings help apps maintain a good rank and encourage downloads, which is why they’re so critical to developers. But for users, having to rate apps has been a poor experience. You’re often interrupted in the middle of trying to use the app, and then asked to exit to the App Store, where you have to sign in to your Apple account, rate, then type your review. With the API, developers can now determine when they want to prompt users to review their app, and then users can complete this process without as much disruption. According to a report from Jim Dalrymple of The Loop, developers will only be able to nag users for reviews three time per year, and once the consumer leaves a review, they can’t be prompted again. Additionally, he says that you’ll be able to switch off notifications for app reviews from the iOS settings. iOS 10.3 will likely be in beta for a month or two, before being released to the public via an over-the-air update. Get a free ASO consultation with our mobile experts here . One of the hardest parts of building a mobile-first startup is getting users on the application itself. You’re not just launching an application. You’re starting a business, creating an experience for your users, and possibly pursuing a passion. App store optimization is a must for every app in order to rank higher on the app stores and be easily discoverable for users. This should be the primary concern for every app developer even before planning the promotion and acquisition strategy. Click here to calculate for free how many downloads could ASO bring to you App! Aid referrals and give your users an incentive to get other users to sign up. Applications that make it easy for users to tell their friends about the app, will generally gain more traction. Applications like Uber, AirBnb, PayPal and Dropbox have run extensive and successful referral programs that have helped their business grow. According to Referral SaaSquatch, Uber has scaled their brand in over 45 countries & 180 cities, with help from their referral program. Uber is now valued at over $18 billion. By simply sending a friend their code, they both will receive a discounted ride. The one referral can turn into 3+ more users introduced to Uber. Referral programs are one of the strongest way to acquire more users without doing much work yourself. Have a stellar interface design. Your design is part of how your application interacts with the user, which makes it remarkably important. With an outstanding design, you can boost user engagement and keep your users coming back to use your app. You must be extremely careful and cautious when creating the design for your app in order to create an addictive design. This also means that you must hire a talented and strong UX Design team. It is critical that proper research, information architecture, wireframing, and user testing goes into your app prior to the visual component. Offer valuable and shareable content to your users. If you offer shareable and valuable content for users to share on their own networks, chances are that the word will spread on your application. Having trouble getting your users to share your content? Offer a reward or promotional code in exchange for sharing a piece of content. Word of mouth is a powerful way to cause a viral effect; you will essentially be getting your users to market your app for you. You must always be thinking of your current users as a way of achieving more, and not just the finishing line. Have a strong marketing presence. Many entrepreneurs believe that they can launch an app and get a load of users on it without any marketing efforts. This is usually untrue. From Codal’s experience, we recommend that the business owners spend at least double of what they spent on their application development for marketing costs. This could vary, depending on the industry. However, a startup usually cannot get by with zero marketing spend. Whether it is social media marketing, physical advertising or content marketing, it is a necessary component to acquiring users and allowing the public to get to know your brand. Keep in mind that marketing is what will get your app in the hands of your users; it is absolutely crucial. Always pull users back on your app with notifications and promotions. Once you achieve your first goal of getting downloads and getting users on your app, you must continue to motivate them to return to your app. Send meaningful push notifications to users, don’t sit and wait for them to return to your app. The content in notifications can range from a tip of how to use the application or a promotion that is currently going on. Notifications should be a staple feature of the application, but you must give the user control over what alerts that they receive. Giving away promotions and rewards is a way to make your user feel special, and inspire them to continue to use your application. Get a free consultation on your user acquisition strategy with our mobile experts here ! The main challenge facing all app developers, once they have developed their app, is attracting new users to the app. The most important part of any advertising campaign is a balanced approach. When running sustainable user acquisition campaigns over a longer period of time, it is best to combine it with a burst campaign to gain a large number of organic users into your app in a short space of time at low cost. Click here to know more User Acquisition strategies with our team of mobile experts . How does a burst campaign work? A burst campaign is an extremely valuable tool to improve an app’s visibility in a short space of time. In the first step, the service provider generates downloads through various app discovery and burst partners. These are apps which offer users an incentive for a download. Quality is an important factor to consider since the ranking algorithms of both Google Play and Apple’s App Store take reviews and ratings into account. Make sure that your app has at least 3.5 stars before starting any burst activity. If your app is of low quality, you will suffer from a wave of negative reviews when you expose it to a significant number of people. Take users’ feedback into account and make sure the app works seamlessly before launching on a large scale. Apple’s App Store ranking algorithm is completely different from that of the Google Play store, which means that burst strategies will work differently in each. Bursts for Android apps are a lot more temperamental – they require on average much higher daily volumes than for iOS and they need to last longer (7-10 days vs 2-3 days) to affect rankings. Consider these differences as you develop your budget for a burst campaign. Additionally, these algorithms are constantly in flux. There are big differences between burst campaigns around the world. The partners involved vary and the number of downloads required to break through into the upper levels of the ranking differ, too. Burst campaigns in the heavily-populated US, with its high level of smartphone penetration, require a much more significant investment than a campaign in Singapore. There are many other considerations, such as average rates of engagement and the leading verticals in different countries. Competition varies across markets, too, and it’s important to know what types of campaigns have worked in the past. This is why it’s essential to choose a burst provider who knows the market and has the right contacts. To figure out the best timing of your burst campaign, consider which lifecycle stage your app is at. Are you launching a completely new app or reintroducing an app with new functionality? Are you introducing a mature app to a new market or region, where you can leverage an existing user base? In addition to lifecycle timing, you need to consider your burst campaign in the context of seasonality. For instance Christmas, Black Friday or a major movie premiere can all determine the focus of user acquisition for a campaign. Even days of the week make a difference for specific app genres and strategies. When it comes to a burst campaign, one size, or one time, certainly doesn’t fit all. A well-planned burst campaign, as part of a complete app ranking strategy, can deliver high direct ROI by reaching a massive volume of users, as well as making the application easier to discover in cluttered app stores. With thousands of apps launching every day, a well-executed burst campaign can be the best strategy to stand out from the crowd of well over 3 million mobile apps globally. We at Supreme Media help you with the best suitable marketing strategies for your app. Click here to get a free consultation with our mobile experts ! Currently, there are more than 2 billion smartphone users in the world. Since humans are more likely to have a mobile device in their possession than a desktop, it is best for the marketers to start building a mobile marketing strategy. The future of mobile marketing is now. Click here to get a free consultation with our marketing experts. CMO spending in 2017 will revolve around mobile-first strategy. From designing mobile-first landing pages to providing interactive web content across social media channels, mobile marketing is a dominant force. 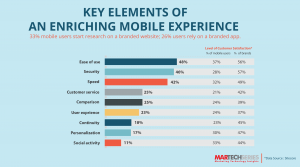 WHAT DO THE NUMBERS SAY ABOUT MOBILE MARKETING? On an average, every user looks at the phone 46 times a day. With more than 90% of mobile phone users glued to the screens for most part of the day, mobile marketing is the quintessential activity every marketer should explore in order to churn new ways of engaging audience and maximizing ROI from their marketing campaigns. 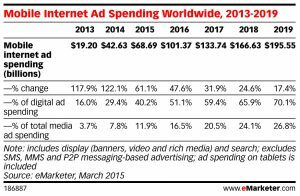 Marketers are investing heavily on digital ads and Mobile ad spending in 2016 alone has been projected to touch US $50 billion – representing more than a 400% increase from 2013. By 2020, the mobile ad spending will cross $100 billion outbidding TV ad spending. Currently, mobile ads account for nearly 50 % of all digital ad spending globally. WHAT ARE THE VARIOUS MOBILE MARKETING METHODS? Mobile marketing ecosystem is in a constant state of flux due to ever-expanding set of channels of communications. Marketers starting fresh with a mobile marketing strategy can initially focus on the following mobile marketing methods. A push notification is a pop-up message that appears on the mobile screen even when the device is locked or the app is not working currently. It is a direct 1:1 platform for marketers promoting a new product launch or driving users to explore vendor’s marketing channels like social and email. In-app messaging is primed to engage a user with more targeted, purposeful interactive sessions while still accessing an app. It is a faster mode of user engagement generating 8 times more response rate compared to push notification models. In-app mobile marketing model allows marketers to project their most valuable promotional/ transactional content to a loyal set of users who recently showed purchase intent. Mobile wallet marketing is the next frontier of digital marketing technology that allows marketers to leverage opportunities across all marketing channels with customized offers and coupons. More than 30% of smart phone users have mobile wallets and most of them are likely to save tickets and offers in addition to making in-app payments.As far as digitally-driven loyalty programs are concerned, mobile wallet marketing can be tracked, updated and loaded with location-based content. SMS/MMS is one app platform that every smart phone user can access to. To begin with a marketing campaign, marketers can either opt for automated email marketing or automated SMS/MMS marketing targeting the same set of smart phone users. Budget-wise, SMS/MMS marketing is cheaper and more ROI-centric than email. By 2020, the mobile apps industry is pegged to generate US$180 billion in revenues via in-app advertising and app store purchases. In 2017, the total number of app downloads is estimated to reach 268.69 billion. Industry-wise, e-commerce and retail mobile apps secure the highest user engagement with an average of 17.5 session launches per month. With the kind of numbers that mobile app marketing holds, marketers can finally move towards developing a single mobile-friendly website rather than working on multiple platforms —social, web and mobile, simultaneously. In fact, Social + Mobile will be the most relevant marketing channel for marketers beyond the existing search engines. Not only does it offer customers a reason to interact with the brand without barriers but also empowers marketers to build a mobile-specific relationship based on customer preferences, analytics, recurrent incentives, discounts and content-driven ROI. For marketers, the future of mobile marketing is pretty much the safest thing to build. Flawless video-based ads, enriching messages, personalized email, MMS/SMS with high-scoring social listening engagement—that’s enough to reach out to every mobile user and deliver targeted products with minimum attribution. Kickstart your mobile marketing strategies with our expert guides here. Mobile app marketing and user acquisition can be done in-house, or with the help of a single seasoned ASO consultant like Supreme Media with a track record of well-optimized apps for better efficiency. If you’d like to take a crack at app optimization and user acquisition click here. The best place to find new users is the App Store itself. App Store Optimization (ASO) is the process of improving the visibility of a mobile app in Apple’s App Store that is a form of mobile app marketing and user acquisition. This usually includes improving indexed copy (title & keywords), creative(s) testing, toggling categories, and toggling other factors in an iTunes Connect app listing and submission to the App Store. Get a Free ASO Consultation With Our Experts Here! Search Ads are an efficient and easy way to promote your app on the App Store for iPhone and iPad in the U.S., helping customers discover it at the very moment they are searching for apps to download. Designed to give users a safe search experience, Search Ads sets a new standard for delivering relevant ads while respecting user privacy. First, to simplify context let’s compare Apps and ASO to Websites and SEO(the rest of the internet) for reference. An important note: 94% of clicks go to organic search results and only 6% go to paid. Search Ads are brand new, so there’s no definitive data on the distribution of downloads between paid & free downloads on the app store. Considering Google’s distribution between free & paid traffic, it’s probably safe to assume that ASO (organic) will continue to be a driving factor of the majority of app downloads. 65% of Apps get discovered on the App Store. — Apple. In the same way websites get discovered on browsers, where they live, apps get discovered on their app store(s), where they live. Besides getting your app ranked on the App Store (sadly, a ~0% chance), or people directly searching your app (or brand) name, ASO is the only inexpensive way acquire new users from the App Store itself. Inexpensive should be a key term here: most apps are free, and free is a function of more users. And if you’re app is paid, people don’t download any app above $0.99. Even so, if you pay for users with an undefined or negative CLV, you’re in trouble. Reaction: $2–5 an install? Damn! Imagine PR, social media, blog mentions, TV, radio, and anything else you use to promote your app are keys. iTunes Connect Keywords are locks. Anyone with a key is looking to put it in a lock, aka your app. 3. ASO is a long-term investment. Just like real estate, ASO is a long term investment that grows in value over time. Simply put: find keywords or phrases that get you downloads, get rid of the ones that don’t. The more downloads you get with a particular keyword or phrase in a short amount of time, the higher you rank for it. In this case Apple views your app as a quality search result and fit for the searcher and searcher’s intent, so they’ll want to show your app more often. A side note; If you’re not optimized for the holiday shut down, you miss out. Apple prepares for the influx of downloads in the holiday season, so they usually shut down the App Store for updates and submissions from December 22–29 yearly. Give yourself some lead time and optimize and submit your app before the closure, and reap the benefits of the App Store’s holiday traffic. Display: Icon, company, title, ratings, “Ad” tag, blue “ad” filter, two line description, CTA (Buy or GET). If you’re going to buy ads, make your first two lines of your description, compelling. You get $100 free in Search Ads to try Search Ads! Supplement keywords and phrases that are not ranking well or driving downloads. 2. Set your total budget & daily budget. 3. Important decision time: Play to your strength or help your weakness? There are a few specific toggling options, but all in all it’s simple — thanks Apple! Many are afraid the Search Ads will contribute to the power law of App Store; that it will make the Store a pay-to-play platform. But, we can look at Google’s SEO & SEM traffic distribution corollary and see that people engage with organic results more than paid. This makes me bullish on the future of the App Store and App Discovery. I believe the distribution of installs driven by both paid and free search results will be the same between SEO/SEM & ASO/PSO. 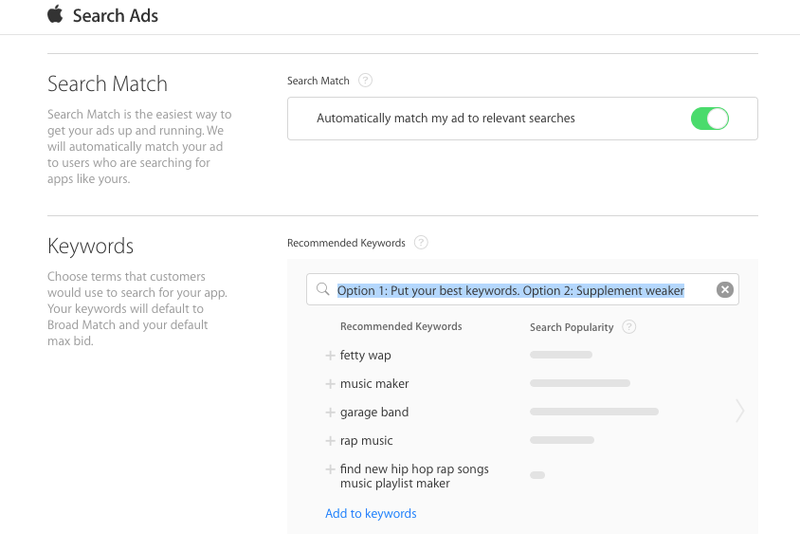 So, to acquire more users: optimize, optimize, optimize (and if it’s right for your app, pay a little bit to Apple’s Search Ads). Click here to get started with your app optimization. Click here to find out how we can help you out with your campaign. What type of users are you targeting – shopaholics, hard-core gamers, or just the average Joe who’s trying to kill some time on the way to work? Usually the more mass appeal an app has, the easier it is to attract new users, which in turn makes climbing to the top of app store rankings easier. Naturally, not every app can be the next Flappy Bird or Facebook Messenger.If your app is more niche, make sure you have the right scale of burst activity; instead of targeting overall ranks, try bursting in your specific category. Quality is a key factor for bursts since the ranking algorithms of both Google Play and Apple’s App Store take reviews and ratings into account.Make sure that your app has at least 3.5 stars before starting any burst activity. A burst presents your app to the population of a whole country. If your app is not up to par, you might suffer from a wave of negative reviews when you expose it to a significant number of people. For very new apps that don’t have any reviews and ratings, you can start with a small-scale test campaign to understand the conversion rate and general appeal of the app.Take users’ feedback into account and make sure all bugs are fixed before launching on a larger scale. Apple’s App Store ranking algorithm is completely different from that of the Google Play store, which means that burst strategies will work differently in each. Bursts for Android apps are a lot more temperamental – they require on average much higher daily volumes than for iOS and they need to last longer (7-14 days vs 2-3 days) to affect rankings.Consider these differences as you develop your budget for a burst campaign. Additionally, these algorithms are constantly in flux. Apple changed the way apps are featured in the App Store in May 2015 and it is important to understand how this impacts a burst campaign. It is important to consider several factors when deciding on a burst strategy for a specific country. Smartphone penetration – the higher the penetration in a market, the more installs are needed to reach a particular rank. Market size – think US vs Belgium. Targeting a top rank in a large market like the US will require far more installs than a smaller market like Belgium. Competition – research the number of similar apps that already exist in a country. Examine those launches to discover what worked and what didn’t. Cultural Appeal – users in different markets often show an affinity for specific types of apps. A top 5 overall ranking or #1 in your app category might seem like obvious targets, but they’re not always realistic for every app or every budget. These rankings are usually occupied by big brands like Google, Facebook, WhatsApp, Instagram, or Snapchat. But you don’t need to be number one to have a successful campaign. Stick to legitimate traffic sources.The ecosystem of mobile marketing encompasses a huge number of channels, and with them come plenty of pitfalls you’ll want to avoid when choosing which sources to use for a burst campaign. There is no shortage of scammers trying to make an easy buck by selling bot traffic or passing incentivized traffic as legitimate.These are fraudulent activities and their purveyors promise the world for the cheapest price you can imagine.Do not be tempted. Fake installs do not contribute to your rank. Do diligent research to identify established and reputable sources of incent, non-incent and app discovery traffic.Otherwise you’re just throwing away your money. The timing of your burst campaign should be informed by the lifecycle of your app. Picking the right strategy at the right stage of your app’s growth is crucial.Are you launching a completely new app or reintroducing an app with new functionality? Are you introducing a mature app to a new market or region, where you can leverage an existing user base? In addition to lifecycle timing, you need to consider your burst campaign in the context of seasonality. For instance Christmas, back-to-school season or a major movie premiere can all determine the focus of user acquisition for a campaign.Even days of the week matter for specific app genres and strategies. When it comes to a burst campaign, one size, or one time, certainly doesn’t fit all.A well-planned burst campaign can deliver high direct ROI by reaching a massive volume of users, as well as making the application easier to discover in cluttered app stores.With thousands of apps launching every day, a well planned and executed burst campaign can be the best strategy to stand out from the crowd.A burst promotion can be a tricky prospect, so it makes sense to get guidance from an expert – at least in the initial stages. Supreme Media takes a consultative approach and prepares a tailor-made plan for each client’s app to ensure the best outcome. We want to help our clients get the best value for their money and ensure that their targets are met. If you’re considering a burst campaign in 2017, get in touch with us here to find out how we can guide you through the process. Now that 2017 is here, it’s time to plan your mobile strategy for the year. Click here to get started. If you think mobile success is about landing pages and app install ads, I have some news for you: In 2017, your mobile marketing strategy will have to include a lot more than just an advertising plan for your app. No, it won’t inflate your mobile marketing budget — it’ll just make it a lot more effective. The strategic product road map must include the development and incorporation of marketing-related features in the app itself, but not only that. An effective onboarding strategy is required for user retention and engagement, as is a push notification strategy that connects with your users at the perfect time, with the right content. In addition, features like social media sharing integration, deep linking schemes, in-app measurement and tracking of user behavior and engagement — all demand that your mobile marketing strategy and product development plans go hand-in-hand. Simply throwing money at install ads is ineffective, and many app marketers are beginning to understand that. Success must be quantified in terms of ROI and user value. To do this, you must consistently and effectively measure and optimize your ad-buying efforts to reach ROI-positive users at the lowest CPI possible. As few as 25 percent of users who install an app will return for a second visit. Additionally, stats show that losing 80 percent of your users within days of app download is very common. That means that three-quarters of your marketing efforts to attract new users to your app fall short and don’t generate positive ROI. That’s where re-marketing comes in: re-engaging dormant users. According to an Econsultancy study, 70 percent of companies say it’s cheaper to retain an existing customer than to acquire a new one. So instead of spending a significant portion of your app marketing budget on recruiting new users (the majority of whom won’t stick around anyway), you can spend less to engage and monetize users who already have your app installed on their device. The listing of your app in the app store is an important aspect of your app marketing strategy — one you simply cannot afford to neglect. The app page in the app store is where users make the final decision — to install or not to install? And they only take a few seconds to make this decision, regardless of how they reached this page (an ad or organic search results in the app store). Another reason for you to invest in an effective app store optimization strategy is that ASO has been proven to be the one of the most cost-effective ways to organically bring relevant and engaged users to your app. Displaying your app to users who are actively searching for a specific solution is the best way to recruit loyal, ROI-positive users. To ensure visibility in relevant search results, a long-term ASO content strategy is required, and now is a great time to start planning yours for 2017, based on performance in 2016. Click Here to get in touch with our ASO Experts. Measurement can’t start and end with the install count. Instead, it needs to be integrated in the app so it can allow for ongoing optimization of your conversion funnel, and let you perform effective A/B testing of your mobile marketing efforts. A/B testing for performance optimization is not limited to your install ad campaigns. Optimization through A/B testing is relevant for just about every aspect of your mobile app. From push notification and onboarding optimization to creative and ASO, A/B testing is the most effective way to refine and polish your product and marketing strategy. The artistic and original side of your mobile marketing efforts needs to be part of your mobile marketing strategy from the very beginning. And it’s not just about attractive visuals and spot-on copy for your ads. It’s also about leveraging the unique capabilities of the mobile platform in an engaging way that’ll motivate users not only to download your app, but to actively use it. A creative and innovative approach can make all the difference. A user-friendly UI (user interface) is a must, and your onboarding process requires creativity and careful planning. Keeping your users engaged with a thought-out messaging timeline, aimed at connecting with users at the right time and with the perfect content for them, will help you shine above the competition. If you’re looking to conquer the world with your app, or if you’re planning to expand to just a few new locales in 2017, this move must be part of your mobile marketing strategy. We don’t need to tell you how important localization is, as studies show that 75 percent of users prefer to buy products in their native language. Localization isn’t about simply uploading your app to international app stores and translating some ads. To succeed in international markets, you must have in-depth familiarity with the target audience’s culture, local trends and the accepted (and expected) style and content. Another important thing to remember is that we live in an internationalized culture. So you cannot ignore multiple native language speakers in a single locale. For example, localizing to Spanish in the US app store will expose your app to an additional 37 million+ users. Your localization efforts should aim to be as inclusive as possible, localizing across all user engagement channels — from the app page in the app store to the app UI. Getting the proverbial worm isn’t about waking up early in the morning. It’s about being early to prepare, innovate and create. It’s about getting ahead of your competition. If you invest time and thought in your mobile marketing strategy for 2017 now, you’ll have a much easier time winning at mobile next year. Get a Free Consultation With Our Experts Here! After spending several years in the app development world, I realized there is one very popular misconception that people have about apps. Most people think that once you publish an app your work is done. You upload it to the app store and then just collect a monthly paycheck. Unfortunately, that’s not the case. Having an app means having a business. And if no one knows about it, no one will pay for it. Hence, it is important to invest time and money into the marketing of your app. In order to make sure you save some money and only do marketing that actually works follow these hacks below. Additionally you should add a blog to your website. First of all, writing good content for a blog will help drive more traffic to the website which can convert to app users. Second, with a newsletter email campaign and regular blog posts you’ll be able to keep your users engaged and remind them to use the app. ASO stands for App Store Optimization. And that is the one most important piece of marketing that many app companies forget to do. For example, imagine you need to find an app that will help you with grocery delivery. You would naturally go to the app store and enter “grocery delivery” in the search. You will see a list of apps ranked based on their reviews, number of downloads and how good their app store optimization is. ASO can be divided into textual and visual parts. For textual optimization you need to focus on the name, keywords and description. For visual it is all about screenshots and the app preview video. For keywords you need to research traffic and competition for keywords you want to target. The best way to do so is to use tools such as Sensor Tower. The goal is to find a combination of high traffic and low difficulty. If the competition is big then it doesn’t matter how high the traffic is because your competitors will take all of it, that is, at least initially when you can’t compete based on the number of downloads and reviews. For the name the most important thing to remember is that whatever you put into the “App name” field in the app store is viewed as keywords by the app store. And those “name” keywords have a bigger role than the standard keywords. Though Apple prohibits keyword stuffing and generally would not approve names that have too many words in them you should still add a tagline with keywords into the app name. For example if your app name is “Slice” and your app does pizza delivery then you should add keywords such as “delivery” and maybe “local” and “pizzerias” into your name. In the description focus on the first 5 lines (255 characters). This is the only thing users will see unless they press on “…more” (which close to nobody does). Make sure that in those first few lines you give a great reason why someone should download your app and include couple of keywords. 1. Name of your company is a strong keyword. If possible use a name that has keywords explaining what you do. 2. There is a correlation in how many times your keywords appear in your reviews and names of in-app purchases and how well you rank for those keywords. 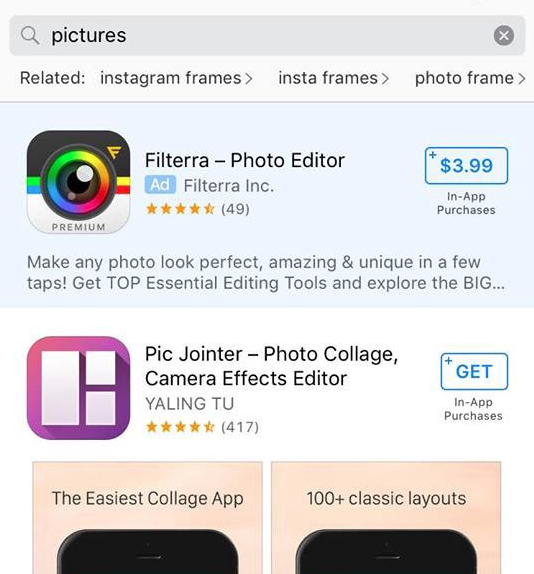 When people are browsing the app store, they mostly pay attention to the screenshots. The paradox, however, lies in the fact that people look at screenshots because they don’t want to read the text description, but they won’t understand your screenshots unless you put some text on them to explain what’s happening. So make sure you create custom screenshots that give 5 (same as number of screens) reasons to download your app. Another important part of visual app store optimization is the app preview video. In the App Store the videos must be no more than 30 seconds and have mostly in-app footage. To make a successful app preview video, you need to utilize it to show the main user story, i.e. show a path user takes to use the main functions of the app. When uploading that video to the app store, you’ll be able to select a cover. The cover will essentially function as an additional screenshot when viewed on the page so make sure it is used to explain a feature or give a reason to download the app. -Give a valuable reward to the person making the referral (“refer and get a free ride”). -Remember to proactively ask users for referrals to make sure they know about the opportunity. Reviews play a very important role in the potential success of your app. The more positive reviews you get, the better your search rankings are and the more downloads and new users you will get. -Don’t interrupt someone’s experience. For example, if your app does food delivery then ask for a review after the order is placed or delivered. Not when the user is browsing the food menu. -Delay asking for a review until the person has used the app for a longer period of time. This will ensure that feedback whether positive or negative will be constructive and will actually increase the chances of a user agreeing to write a review. -Capture negative reviews. If the person does not like the app give them an option to send you the feedback directly. This way you’ll prevent them from writing negative comments about the app publicly. -Your app will be tested by a larger number of people which would help you identify any remaining bugs and fix them before the release. -Open betas create loyal customers. Most people like to see how the product they found when it was unknown grows. Give them an opportunity to join your journey and they will reward you by staying loyal to the app and telling their friends about it. Remember that having an app is managing your own business. If no one knows about it no one will pay for it. Marketing strategies might be different for different apps, but investing your efforts in marketing is key to launching a successful app. Since the beginning of the year you have all be seeing dozens of articles similarly titled to this one. Some will even take the bold stance, luring in readers with catchy headlines like, “CONTENT MARKETING IS DEAD” or “SOCIAL MEDIA IS A WASTE OF YOUR TIME.” But contrary to what these articles would have you believe, few marketing strategies really ever die out completely. Rather, they simply become a less efficient use of your time. Get in touch with our mobile experts to plan your best marketing strategy here . Of course, there are exceptions (cough, Vine, cough), but for the most part, no one can tell you what’s going to be “out” in 2017. Different online platforms and the marketing strategies that fuel them are constantly evolving, just like the preferences and behavior patterns of users collectively. There’s no telling which marketing tactics will make a comeback. There are, however, some not-so-surprising things you can probably go ahead and strike off your to-do list in 2017. This should be obvious, because clicks are nice, but conversions are better. This is especially important for those investing in any kind of paid search optimization/campaigning, because money is at stake. Above all else, your priority should be to get users to take a certain action (making a purchase, entering contact information, whatever). Instead of optimizing with the goal of enticing clicks, try and think more holistically about an approach that will have an end result of conversions. Start by addressing common things that hold back conversions, like web design or a poor landing page. Then see that your conversion strategy aligns with your target audience. Whatever you do, don’t waste your time thinking mere clicks are the key to success. Just. Don’t. Do it. Yes, having tons of content can make it seem like you have a surplus of resources on your website, but if they’re all low quality, you’re wasting your time. Having hundreds of pages of thin content will not only not help you get the kind of user engagement you need, but it’s also punishable. Plus, why would you even want to seem spammy? Your focus should be on quality, original content that contributes to a positive user experience. Google does everything with user experience in mind, and so should you, because that’s the kind of thing that gets rewarded on search engines. In 2017, make quality the focus of your content marketing strategy. Go back and look at where you may have dropped the ball on quality in 2016, and strategize ways to do better going forward. At this point, if you’re still avoiding mobile optimization, you’re just willfully choosing to set yourself back. Mobile optimization is an undeniable component of browsing behavior, and your participation is required if you want to remain competitive. The good news is that the shift to mobile is so significant that Google has made it pretty easy to switch over to a mobile-first design. PPC, Google’s expanded text ads that rolled out in August took care of mobile-preferred ads, so now one ad format adjusts across all devices. To thrive through 2017, all you really need to do is make your website mobile-friendly and ensure that it’s locally optimized. Why App Store Optimization is So Important ?